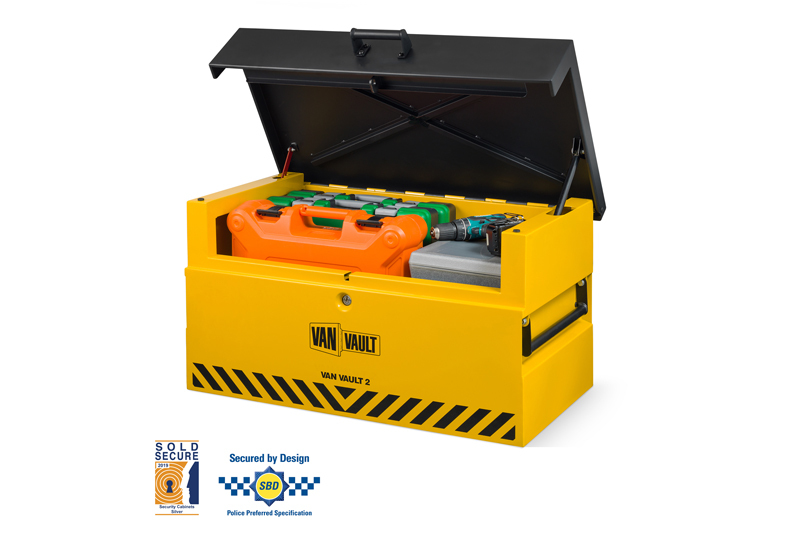 As part of its drive to tackle tool theft crime, Van Vault has launched a new product range. Last year saw around 280,000 tool theft crimes across the UK. 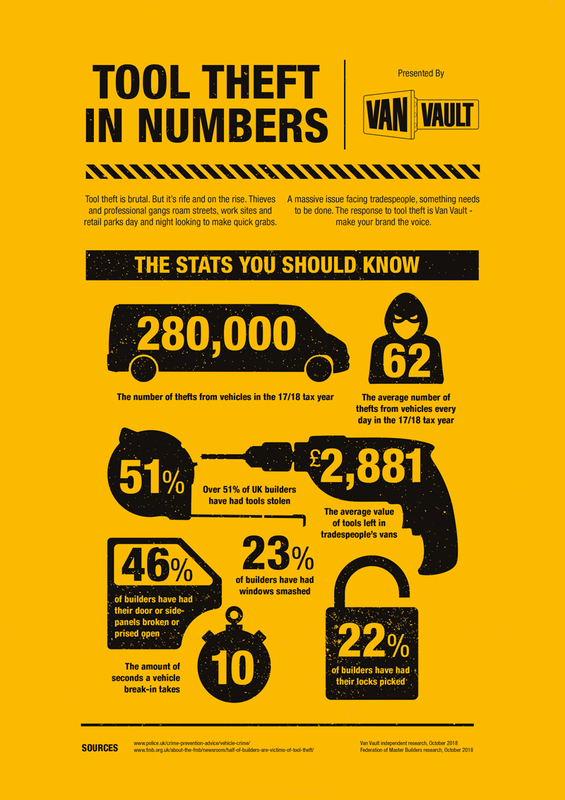 With the average value of tools left in tradespeople’s vans costing £2,880 (according to independent consumer research carried out by Van Vault), it is vital to protect tools and deter thieves with effective secure storage solutions. With a break-in taking as little as 10 seconds, the new range has introduced key enhancements, which will be fundamental in making it much harder to steal valuable power tools and equipment. The new product launch follows 18 months of development work and features eight new products offering advanced protection, including the traditional box style containers and the easy to use drawer sliders – which are unique to the Van Vault brand. Not only has the product been upgraded, it has also been independently tested and certified by Sold Secure, an independent test house for security products owned by the Master Locksmith Association. All eight Van Vaults were subjected to six different levels of rigorous attack by trained professionals and were all found to be impenetrable. Van Vault is also the first vehicle storage product on the market to be accredited by Secured by Design – the UK’s Police approved standard. Secured by Design promotes products which prevent crime and it’s the only form of police approval for UK products. All of the key areas of attack have been strengthened – including a cross bar reinforced lid which is next to impossible to prise open. A new VaultLock locking system has been introduced which sits deep within the body of the box shielded by a hardened steel plate, protecting from drilling, picking and cutting. The products also now come with an anti-theft fixing kit to ensure they can be properly mounted to the vehicle floor. Deborah Hunt, Marketing Manager at Van Vault, said: “Tool theft is a massive issue facing tradespeople today and it’s on the rise. One in three tradesmen have had tools stolen. As the UK’s number one brand, we know we have an important role to play in protecting our customer’s tools and helping to fight tool theft. Innovation is key and with our new range, we have reacted to what customers really want – the best security, functionality, quality – all which gives them peace of mind. Quite simply, tradespeople cannot afford to be without a Van Vault. Following strong customer demand, Van Vault has also improved its storage space and functionality with the new range, introducing a wide mouth drop front to the storage containers, which provides greater access and visibility of the contents inside. A recessed lock also protects the key from damage, when left in the lock and an easy-lift gas strut through the body of the box, ensures a soft open and close lid action and maximises storage space.